Éclairs typical don’t show up on a list of holiday desserts. But when they’re as cute as these, they’re irresistible. Made by Art Éclair, these designs are just a few of a treasure trove of magnificently decorated éclairs. See the collection on the Art Éclair website and on Pinterest. Regrettably for éclair lovers, this bakery is in Kiev, Ukraine. We’ll have to settle for a Bûche de Noël. Thanks to Santa Barbara Chocolate Company for this easy recipe for chocolate marzipan. Here’s the original recipe so you can follow each step in photos. 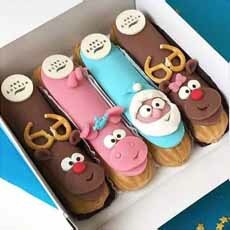 Fun holiday éclairs from Art Éclair. 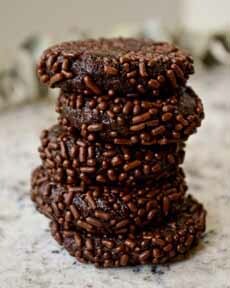 It’s easy to make chocolate marzipan (photo and recipe courtesy Santa Barbara Chocolate Company). 1. CHOP the peeled almonds and pulse in a food processor until they achieve an almond flour texture. You don’t want any chunks left; if you can’t pulse them all away, sieve the powder before using. 2. COMBINE the almond flour, cocoa powder and powdered sugar in a saucepan. Mix together. Add the egg and place the pot over low heat. 3. STIR continuously until all the ingredients are combined. Keep stirring for another 5 minutes, then remove the pot from the heat. Place it in the refrigerator and let the marzipan chill for 15 minutes or longer. 4. Roll the marzipan into a tube shape the width of the face, 1″ or smaller depending on the width of the éclair. Chill until firm enough to slice. Slice thinly; you’re ready to assemble. When you’re done with the faces, cut ears. 5. If you have leftover marzipan, you can re-shape it into a wider tube and cut marzipan coins to serve separately. Roll them in sprinkles or nuts, as in photo #2.